When I think of point and click adventure games, I think of three series: The Longest Journey, Monkey Island, and Broken Sword. When I think of those, I think of great plots and challenging puzzles. But what happens if those two elements aren’t quite so good? With an adventure game, you really can’t have high-octane action; they’re a much more cerebral experience. So if those two elements aren’t great, then you’re left with a game that’s not very compelling. And that’s exactly the problem with Age of Enigma: The Secret of the Sixth Ghost. In Enigma, you play as Ashley, a woman on the cusp of realizing her potential as a medium. Ashley is plagued with dreams about a mysterious house and receives a letter with the address, layout of and key to that house. Ashley heads to the house despite not being completely sure why. There she discovers that she must help six ghosts complete their individual journeys into the afterlife. For all intents and purposes, Enigma is a straightforward point and click adventure game. You’ll spend virtually all of your time searching for items around the environment in order to solve puzzles. There are two different types of puzzles in Enigma. There’s your standard fare adventure puzzles such as combining items to gain access to new areas and so forth. These range from rebuilding a small totem to trimming a bonsai tree to match a photo. Thankfully, there are no puzzles involving inflatable ducks and subway tracks or pies and yetis. In addition to these environmental puzzles, there are also logic based puzzles. The logic puzzles are pretty clear-cut as well, to the point that one of them is basically Sudoku. 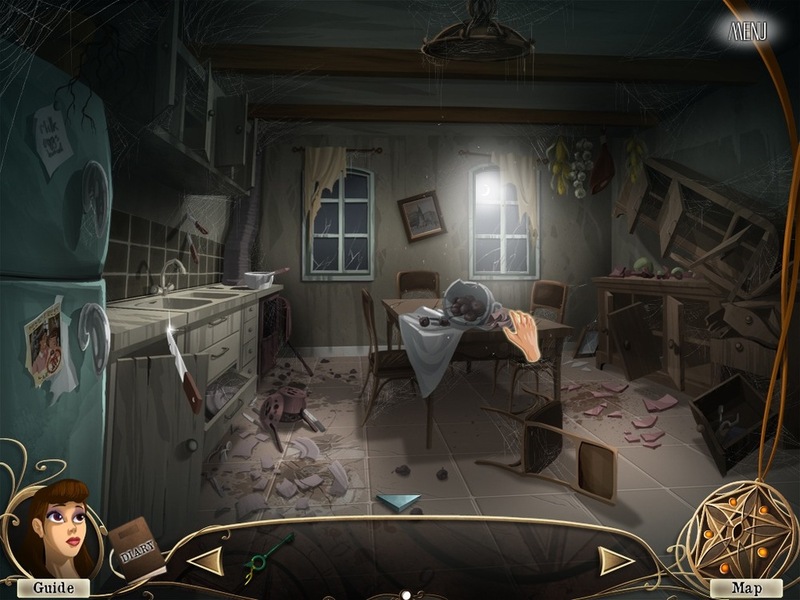 Both of these types of puzzles exist into two different types of settings: the house and the eras in which the ghosts were alive. Each ghost is bound to this world because of something they did while they were still alive. So you'll be tasked with gaining their trust and then traveling into the past to fix what they did wrong. None of these puzzles, environment or logic, are particularly difficult, but the game does have a hint system. Like many point and click games, you keep a journal in order to remeber what you need to do next. This is also where you get your “hints.” But these hints don’t leave much to the imagination. With the logic puzzles, you can also get help in the form of “Jokers.” Each puzzle has up to two Jokers that can be applied and they simply make the puzzle easier. For example, with the Sudoku puzzle, using a Joker will fill in a row with the correct numbers. If you still find the puzzle too difficult, you can out and out skip it without any consequence. The graphics in Enigma are a mixed bag. On the one hand, the cartoon feeling is nice. There’s a real pre-90s cartoon art style to everything. It’s colored richly and the environments are well detailed. The environments are actually quite diverse too, as you will be traveling from the Azteca Empire to the Egyptian pyramids to feudal Japan. Each environment is very distinct and well drawn. The animations, on the other hand, aren’t so nice. While there are a few ghosts that are actually animated, most characters simply phase from one motion to the next. A character may be standing, and then his arm will fade from by his side to pointing to a room without any actual animation. There are some fun puzzles here. There’s one in particular in which you must search for buried treasure. It really harkens back to older point and click games. But Enigma took me less than two hours to beat, and for as short of an experience as this is, there should be a lot more stand out puzzles. Also, I get the distinct feeling that the game is supposed to be creepy, if not downright scary. Ashley’s heart will beat hard sometimes. The music also tries to set the mood. And let’s not forget that we’re dealing with ghosts, but the problem is that the game isn’t scary. At all. Not even a little. Age of Enigma: The Secret of the Sixth Ghost is a decent game. There’s nothing broken in it by any means. It’s simply not a good game, feeling a little derivative and uninspired. If you’ve haven’t played many adventure games, there are hosts of them (like the series I mentioned at the beginning) that you can get for much less than Enigma’s still reasonable $20 price tag. Conversely, if you’re a veteran of the genre then you should know that Enigma will probably not reach your standards of a good adventure game.